In August 1886 the Legislative Council voted a sum of £5000 to celebrate Queen Victoria's Jubilee. Part of this sum was used to lay a foundation stone for a library at a site in St George's Terrace on 21 June 1887. 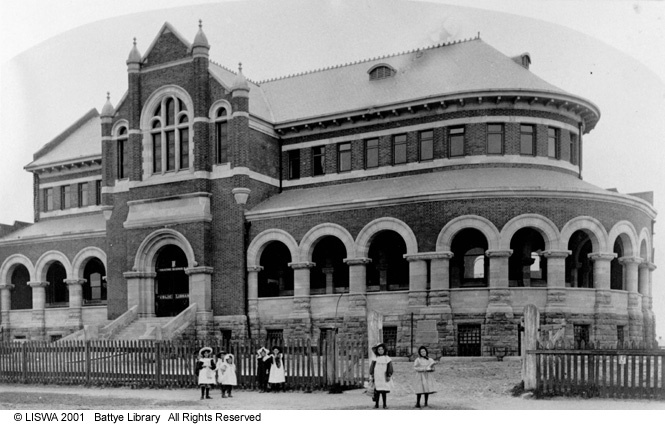 However, the Victoria Public Library (named for Queen Victoria), initially opened on 26 January 1889 in temporary premises in a bank building on the opposite side of the street from the foundation stone site, with 1796 volumes on its shelves. On 14 August 1894, James Sykes Battye, then aged 23, commenced as Chief Librarian of the Victoria Public Library, a post he was to occupy for nearly 60 years. In August 1897 the Library transferred to a site in James Street, also shared by the Museum and the Art Gallery. As this soon became very cramped, in 1903 the Library moved a few dozen yards into the rear half of what was to be its permanent home for over 80 years. In 1904 the name was changed to the Public Library of Western Australia to avoid confusion with the Public Library of Victoria. In 1911 construction began on the second half of the Library's permanent quarters. This imposing facade, known as Hackett Hall after Sir John Winthrop Hackett, opened on 18 August 1913. In 1951 responsibility for the Public Library was transferred to the Library Board of Western Australia. After Dr Battye died in 1954, the State Librarian, Francis Aubie Sharr (appointed 1953), reorganised the State Library into subject divisions. All Western Australian material was gathered together into one branch and opened on 14 December 1956 as the J. S. Battye Library of West Australian History and State Archives, so named to honour the role played by Dr Battye in the acquisition of the collection. The State Archives, now the State Records Office, operated its own reading room from 1991, administratively split from the Battye Library in 1997 and became a separate agency responsible to its own Minister with the passing of the State Records Act in 2000. 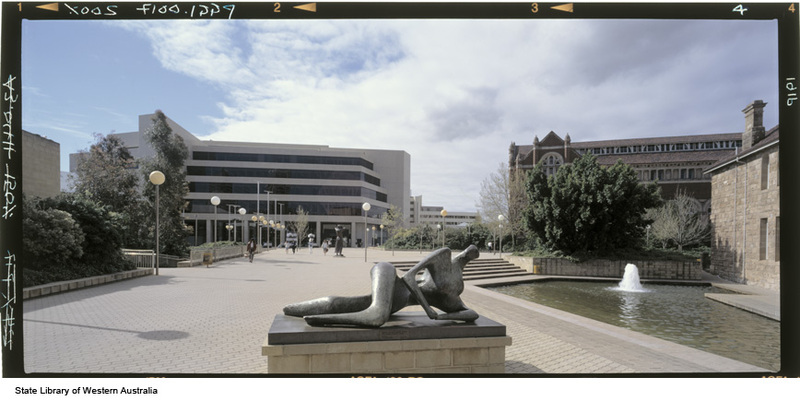 The present Alexander Library Building (named after the first chairman of the Library Board of Western Australia, Professor Fred Alexander) opened to the public in April 1985. The Battye Library has a dual role: to acquire and preserve printed and other material produced in Western Australia, written by Western Australians, or relating substantially to Western Australia; and to provide an information service to the public based on this material. The objectives of preservation and use sometimes conflict, and methods such as microfilming or digitisation and the acquisition of duplicate copies of material, are used to overcome this difficulty. This is an area of common concern to all preservation libraries, and one which requires constant monitoring of collections to ensure that material does not deteriorate to the extent that it becomes unusable. The Battye Library collects all forms of documentary Westraliana excluding major artworks, realia and government archives. Comprehensiveness is aimed for in some collections and in others selectivity is applied as the Battye Library recognises that it cannot collect everything produced in Western Australia. 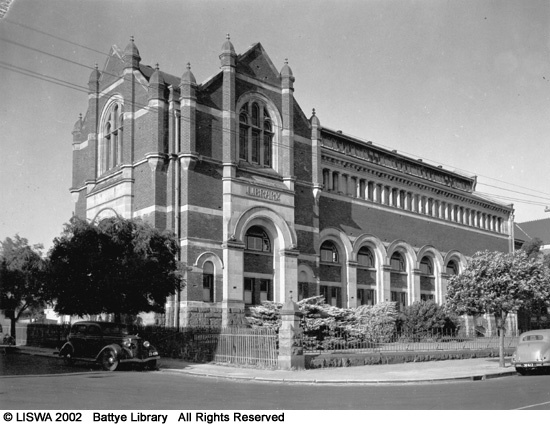 Some Battye Library material is available for loan, but only if second copies exist, either through the public library system or direct from the State Library if one has a borrower's card. This can be obtained by producing proof of residence and filling in an online form. The following is a brief description of the various formats of material collected by the Battye Library. The Copyright Act 1895 required that one copy of each book published in Western Australia was to be lodged with the Library. Usually a second copy was acquired for public use and the legal deposit copy became the preservation copy. Items published outside the State written by Western Australians or containing material relating to Western Australia or Western Australians are also acquired. One copy of any serial publication, whether regular or irregular in frequency, was also acquired under legal deposit provisions. The Library holds many serial titles including annual reports and newsletters of various associations such as societies, businesses and social and sporting clubs. A Premier's Circular provides for the deposit of all government agency publications with the Battye Library. Local authorities' publications are also acquired. Government publications are generally books, serials, maps or ephemera and can include annual reports, reports, staff magazines, departmental serials, brochures etc. 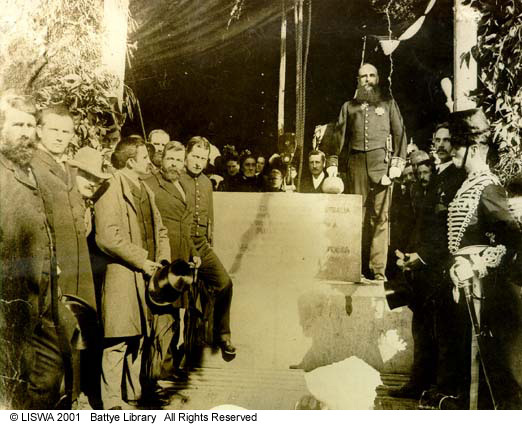 Under the terms of the Newspaper Libel and Registration Act 1884 one signed copy of each newspaper published in Western Australia had to be lodged with the Battye Library. The Battye Library has full holdings of many newspapers issued in Western Australia since 1830, including some in manuscript form. However, there are titles in the collection for which we have missing years, months, weeks or individual issues and other titles for which we have no issues at all. If you find old Western Australian newspapers, please check with the Battye Library Subject Specialists or Collection Development before disposing of them (this is especially relevant for newspapers published in the 19th Century and the first half of the 20th Century). A list of some of our missing newspapers can be found on the National Library of Australia's website. Part of the collection has been microfilmed for public use, and the remainder is available in its original form. The National Library of Australia is currently digitising Australian newspapers into a searchable database. The West Australian has been digitised from 1833-1954 along with the Western Mail 1885-1954, the Western Argus (Kalgoorlie) 1894-1938, the Sunday Times 1897-1954, the Daily News 1882-1950, The Inquirer 1840-1901, The Mirror 1921-1956, the Albany Advertiser 1897-1950, the Geraldton Guardian 1906-1950 and the Northern Times 1905-1952. Other titles will be digitised over the coming years. Photocopying is not permitted from bound newspapers due to risk of damage. The Battye Library houses an extensive collection of ephemera and minor publications such as souvenir brochures, invitations, theatre programs, art exhibition catalogues, election material etc. Our large collection of maps ranges from charts of the early Dutch and French explorers and the first surveys of the Swan River Colony to maps issued by Landgate and other authorities. The major part of the Pictorial Collection comprises photographs and postcards, but paintings, drawings, engravings and prints are also included. Images are selected for documentary rather than artistic merit. The collection covers the period from c1845 to the present day, its strength being in the 1890s to the 1960s, with an emphasis on social life, agriculture, mining, townscape, landscape, portraits and Aboriginal people. More emphasis is now being given to images documenting aspects of contemporary life in Western Australia. Some of the collection has been digitised and is available online, but the vast majority is still available for viewing in bound volumes of photocopies of original photographs. Oral History was first undertaken by the Battye Library in 1961 and over the years the oral history collection has developed into one of the largest in Australia. Since the inception of the Western Australian Branch of the Oral History Association of Australia, the Battye Library no longer carries out any actual interviewing, but collects copies of interviews done by various individuals and associations. In most cases, transcripts or synopses of interviews, as well as the tapes are available for public use. A program is about to be undertaken whereby oral history interviews will be digitised and available on our website. The State Film Archives came to the Battye Library in 1978 from the Audio Visual Education Branch of the Education Department. Film, video and DVDs produced by government agencies (also under the Premier's Directive), as well as commercial and private film, are collected. These are the non-current records of private individuals, families, churches, trade unions, companies and businesses and other non-government organisations. Most of the collection has been donated and many items are microfilmed or photocopied in order to protect the original. Private archives include diaries; correspondence; baptismal, marriage and burial records; station records; newspaper scrapbooks; architectural plans and unpublished original maps. A major function of the Battye Library is to provide a reference and information service. Staff are on duty to assist people who come into the Library and to provide information sought over the telephone. As well, letters and emails from people in Western Australia, interstate and overseas are answered. However, the Library does not carry out in-depth research and, where it is deemed necessary, those requiring such research will be directed to find a researcher who may undertake such work for a fee. The Battye Library caters for requests for copies of items in its collection where possible. Facilities exist for both photocopying (black and white and colour) and for making reader prints and scans (which can be emailed, or downloaded onto a disk or thumbdrive) from microfilm and microfiche. As much of the collection is rare or fragile, it cannot be photocopied (this applies to all bound newspapers, certain books and serials, outsize maps, ephemera and private archives). For items in these categories a digital scan may be made instead. In some cases the public may be able to use their own digital camera to make copies. There is also a digital camera available in the Reading Room for public use should a copy of a rare item be required. 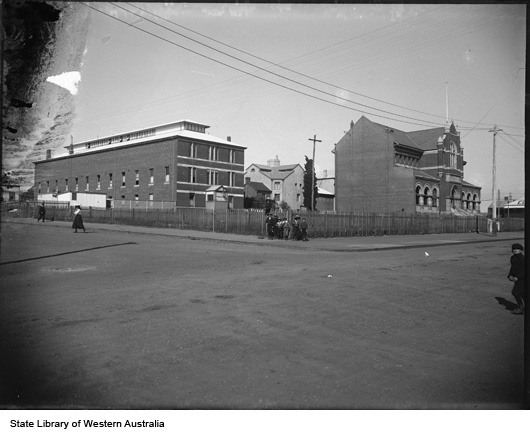 The State Library maintains a close relationship with the Western Australian Genealogical Society. Members of the Society are rostered in the Genealogy Centre on the 3rd Floor on Tuesdays, Wednesdays and Thursdays from 9.30am to 1.00pm. to assist the public in researching family history. Staff of the State Library may be available to provide guidance or advice on the arrangement of local history collections, including material such as private archives, photographs, newspapers and ephemera (subject to staff time being available). Reader education programs and tours may be conducted for schools and universities. The Battye Library is presently open Monday to Thursday 9.00am-8.00pm, Friday 9.00am-5.30pm and Saturday and Sunday 10.00am-5.30pm. It does not open on public holidays.